Delusional: Is This What We Are to Expect from the New Trump Administration? Furthermore, after many reports challenged Spicer’s assertions, the new administration doubled down on the charges. Reince Priebus, the new White House Chief of Staff, vowed on Sunday that the new administration will fight the media “tooth and nail every day and twice on Sunday” over what they see as unfair attacks on Trump (by claiming, falsely they say, that the crowds had been larger at Obama’s inauguration). And Kellyanne Conway, a spokesman for the White House and Counselor to the President, said on Sunday that what Press Secretary Spicer had asserted was not wrong but rather “alternative facts”. Finally, one has Donald Trump himself, who claimed that he saw what “looked like a million, a million and a half people” present at his inauguration as he took the oath of office. One does not know how he was able to make such a count, and perhaps he should not be taken too seriously, but his administration’s senior staff appear to be obliged to back him up. What do we know on the size of the crowds? One first has to acknowledge that any crowd count is difficult, and that we will never know the precise numbers. Unless each person has been forced to pass through a turnstile, all we can have are estimates. But we can have estimates, and they can give some sense as to the size. Most importantly, while we might not know the absolute size, we can have a pretty good indication from photos and other sources of data what the relative sizes of two crowds likely were. The crowd in 2017 is clearly far smaller. This has nothing to do with the white mats laid down to protect the grass (which was also done in 2013 for Obama’s second inauguration). There are simply far fewer attendees. There is also indirect evidence from the number of Metrorail riders that day. 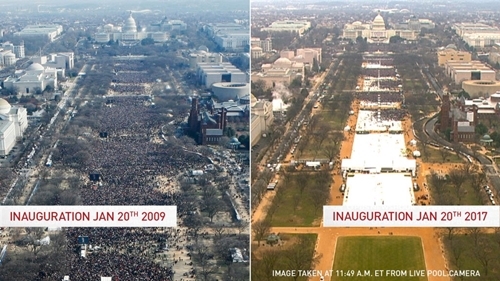 Spicer said in his press briefing “We know that 420,000 people used the D.C. Metro public transit yesterday, which actually compares to 317,000 that used it for President Obama’s last inaugural.” Actually these numbers are wrong, as well as misleading (since the comparison at issue is to Obama’s first inauguration in 2009, not to his second in 2013). As the Washington Post noted (with this confirmed by CNN) the correct numbers from the Washington Metropolitan Area Transit Authority (which operates the Metro system) are that there were 570,500 riders on Metro on Trump’s inauguration day, 1.1 million riders in 2009 on Obama’s first inauguration day, and 782,000 riders in 2013 on Obama’s second inauguration day. What Trump’s press secretary said “we know” was simply wrong. It is also simply not true that Trump drew a larger estimated TV audience than any president before. Nielsen, the TV ratings agency, estimated that Trump drew 30.6 million viewers, while Obama drew 38 million viewers at his first inauguration. And Reagan drew more, at 42 million viewers, for his first inauguration. Furthermore, both Nixon (in 1973) and Carter (in 1977) drew more viewers than Trump, at 33 million and 34 million respectively. The Trump figure was far from a record. So how many people attended Trump’s inauguration, and how does that figure compare to the number that Obama drew for his first inauguration? A widely cited figure is that Obama drew an estimated 1.8 million for his first inauguration, but, as noted above, any such estimate must be taken as approximate. But based on a comparison of the photos, experts estimate that Trump drew at most one-third of the Obama draw in terms of the number in attendance just on the Mall. There were in addition many others at the Obama inaugural who were not on the Mall because they could not fit due to the crowding. Why does this matter? It matters only because the new Trump administration has made it into an issue, and in doing so, has made assertions that are clearly factually wrong. Trump did not draw a record number to his inauguration, nor a record number of viewers, nor were there a record number of riders on the Washington Metro system. These are all numbers, and they can be checked. While we may not be able to know the precise number of those who attended, we can come to a clear conclusion on the relative size of those who attended this year versus previous recent inaugurations. And Trump’s attendance was not at all close to the number who attended Obama’s first inaugural. What is disconcerting is that Trump, his new Press Secretary, his Chief of Staff and others in his administration, should feel compelled to make assertions that are clearly and verifiably wrong, and then to attack the press aggressively for pointing out what we know. And this on his second day in office. While this is not inconsistent with what the Trump team did during his campaign for the presidency, one would have hoped for more mature behavior once he took office. And especially so for an issue which is fundamentally minor. It really does not matter much whether the number attending Trump’s inauguration was more or less than the number who had attended prior inaugurations. Presumably (and assuming thought was given to this) they are setting a marker for what they intend to do during the course of the presidential term, with aggressive attacks on the press for reporting errors in their assertions or on contradictions with earlier statements. If so, such a strategy, including denial of facts that can readily be verified, is truly worrisome. Facts should matter. Not all that we will hear from the new administration will be so easy to check, and the question then is what can be believed. Perhaps, and more worrying, they really believe their assertions on the numbers attending. If so, they are truly delusional. This entry was posted in More Political than Economic and tagged Trump, US politics by aneconomicsense. Bookmark the permalink.